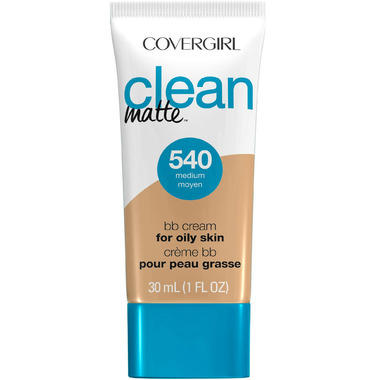 Covergirl Clean Matte BB Cream provides the perfect amount of coverage to even skin tone, hide blemishes and keep you shine free all day. Ideal for Oily skin. Love how the product performs. It gives the coverage of a foundation, but is much lighter and I have no problem getting it to stay all day. The one downside is the shade selection. Even the lightest shade is at least a full shade too dark, almost two shades too dark int he winter. This is fine if you're planning on using it under foundation, but if you plan on using it on its own, which is what I'd like to do as it really is a fantastic formula, it might be an issue. If you can find a colour match, definitely give this a shot, as it really does perform well. Gives my skin a naturally flawless look with build-able coverage. I find it easiest to apply with a damp sponge. It stays matte all day! I really like this BB Cream. Keeps the shine away and doesn't irritate my skin!